To make social media from athletes and prominent figures involved in London 2012 an integral part of the conversation with our audiences. Originally this was proposed with the emphasis on BBC Three with its younger audience more attuned to social media, in particular programmes presented by Jake Humphrey. Once we started developing the proposition, it became obvious that we could make this work as part of output across all timeslots and networks. How did we reflect this in presentation? By using it as a natural part of the script and flow of programmes. As far as possible it was treated as part of a conversation within the programme rather than something from outside the programme. What we wanted to avoid was the jumping out of narrative experience where the social media is presented as “here’s the social media bit!” as if the conversation is entirely disconnected from what is happening onscreen. We also looked to use new technology such as Kinetrak, Splashtop and iPads to offer innovative ways of presenting the information onscreen. With Kinetrak, the feature was the presenter-controlled graphics, not the content – we used it for medal tables, stills and not just social media. The backend was an iteration of IMI Mobile‘s platform, better known to BBC staff as the MMC or WIN Multimedia Console. This console pulls in social media feeds from a variety of sources and allows the producer to output them, via selected feeds, to assigned destinations (eg graphics, presenter device). The Olympics iteration took advantage of a broad range of functions that I knew existed in different parts of the BBC but which hadn’t necessarily been used together in the same iteration. Each user was given a unique login, allowing me to track and audit usage, and training on how to make best use of the functionality for their output. IMI also supplied functionality which allowed social media to be pushed to presenters on an iPad by the producer/gallery and skins to brand them with. For onscreen, Mammoth Graphics handled presentation and worked with Kenziko to pass the output feeds from console to Viz RT graphics machines. They also delivered the Kinetrak solution for gesture-based presentation which you can see on their website. The key to making it stick in programmes is the presenter. If they feel comfortable and engaged then everything else can flow from that. We were lucky to have a group of presenters who, across the board, felt able to discuss and involve themselves in how and when we could use social media in their presentation. Jake Humphrey was probably the presenter who delivered the highest profile engagement. His track record with engaging audiences through twitter from F1 proved invaluable in driving the usage of social media in programmes he was presenting. Even when faced with the logistical challenges of the Velodrome which meant he simply didn’t have space or time to use the iPad, Jake could be seen using his smartphone to find material and use it in the programming. His on and off air engagement certainly benefited the programmes he was presenting, opening them up to an audience who really appreciated him. Clare Balding built a very strong engagement, not just in the studio but everywhere she went, through her calls to engage with #BBCMoment, rallying thanks for the Gamesmakers and in the way in which her dialogue with the athletes and celebrities around the games enhanced the BBC’s reputation on social media. As a pundit, Ian Thorpe shows how strong a growth trajectory a considered and well-thought out attitude to social media can develop. From a standing start during the Games, he grew into an easily recognisable and engaged personality on twitter. On BBC Three, Sonali Shah, Rishi Persad and Manish Bhasin were all genuinely engaged. It wasn’t uncommon for them to be requesting material to use in programmes rather than wait for it to be provided. BBC One were more restrained in their use by the nature of output but they were receptive and willing to use content where they could. The use of it during the big interviews in Gary Lineker’s peak-time show worked well and allowed it to be woven in without having to explicitly refer to it on air. Matt Baker and Jake Humphrey were both comfortable with using material and even more ‘traditional’ presenters warmed to the possibilities. For me the proof of this comes from a moment that happened in the studio, unseen by the audience: Sue Barker reading tweets off an iPad and then dropping them into her script on air as casually and naturally as Jake. Output producers and editors are just as valuable in the process. The ones who made best use were the ones were most receptive and made the effort to figure out how and when to include material. The BBC Three teams had more of a remit to do so, but I was really happy that the output editors all took the time to learn how to use to console and were willing to suggest ways of making it work for their particular programme. Production teams, including the Multimedia Broadcast Journalists/TV Sub-editors, who engaged with the console and learned how to benefit from it inevitably gained the most in terms of reflecting the conversation onscreen. Having support for what we were trying from all parts of the organisation, top to bottom, was also really valuable to me on a professional level, as it allowed me the confidence to try methods of working without the fear of what the reaction would be from senior management. Missed opportunities or managed experience? In some programmes we used less social media because it failed to pass muster with our rules. For example, during Super Saturday on BBC One where there was so much happening that it simply made no sense to be trying to get the reaction from athletes into the programme because the action just kept coming. On Olympics Tonight we had conceived there would be social media but given its late timeslot and that the action would be some distance from the time of the tweets, we questioned what it would add. This was in the sense of asking what a tweet from mid-afternoon would add to an interview or discussion at nearly 11pm. We didn’t exclude material and it informed the programme where relevant, but we felt that featuring it would look dated given how moods change on social media and that the aim was to reflect the conversation happening relatively concurrently, not conversations that happened in the past. My main disappointment was that I was not able to better support morning programmes as well as daytime and evenings. If I could have cloned myself, I think we could have made much greater impact by covering the beginning of the day when there’s the opportunities to use social media to talk up the upcoming action. Mishal Husain was keen to engage and use her audience and experience from working across BBC News output and there were certainly opportunities to do a mix of review/preview of the day’s action. The flipside to this is that on BBC Three, the morning gallery team were trained on the console and found ways to use it to deliver content unsupported by a social media producer. Sonali Shah’s interview with Laura Trott was done entirely by the production team and presenter working with graphics and entirely on their own initiative. Where does a social media producer fit into the production workflow? Positioning of the social media producer is key. At London 2012, the role was new and so much of my experience was discovering what could be considered best practice and then trying to apply it. Over the course of the fortnight, we established that the most effective way for the role to work is for it to be part of the output gallery so that they can gauge the programme demands and adapt to changes in live output accordingly. With two live galleries running at the same time, this raised the question of whether one person is enough. My experience was that given the nature of live sport, it was rare that both BBC One and Three would be looking for social media output at the same time. Part of the role is clearly identifying opportunities in the schedule for social media content, which requires knowledge of the schedule of live events and liaising with output editors to establish requirements and to offer content as appropriate. This is more straightforward at either end of the day when there are fewer major events to choose from, but it can be complicated during the peak hours when the number of events mean that programme running orders are much more fluid. Given the ad hoc nature of live schedules during peak, this makes it challenging to work across the two galleries’ output simultaneously. Being mobile helped but I did feel there were times when it was impossible to be in two places at once. This would be best mitigated by having backup in the form of training for output editors and production co-ordinators so that they aren’t reliant on the Social Media Producer. #bbcmoment used unprompted by Clare Balding – which led to gallery and feature across platforms. This came from Clare, not from our prompting, showing that a simple proposition can be effective in moving the conversation from an off-air space towards broadcast. Jake Humphrey punts out for questions for Brad Wiggins and gets hundreds. This shows how a combination of presenter-led effort with a nice clear CTA and the support of the programme team to get it on air can really lead the editorial in a way that delivers something fresh and different from the standard interview. You can also see how Jake is using the iPad functionality to script the interview questions as part of his range of presenting options. In the studio environment we experienced almost no issues in delivering a workable connection for the presenter to receive social media at their presentation point. This was done over a dedicated wireless connection. As much of what we delivered was text based, it was relatively low bandwidth. We did not make any significant use of the technology for presenters on location due to lack of guaranteed bandwidth. This is an area we should explore for future events with the possibilities of 3g/4g or our own wireless provision. So we used it, there were no major disasters or emergencies, and most people appreciated it. I’d say it’s worth doing it again. See you in Rio 2016, or maybe sooner? Tomorrow will be my last day based at BBC Television Centre, Wood Lane, London W12 7RJ. I first worked here in 2002, a few months after joining the BBC for the first time. It is a special place that will be much missed by many. Don’t believe the denigration of it by the likes of John Simpson, that’s just what BBC staff do: we publicly complain about what we can complain about because there’s lots we’re not allowed to complain about publicly. Deep down there is a strong attachment and genuine love for this eccentric building with its hidden genius. 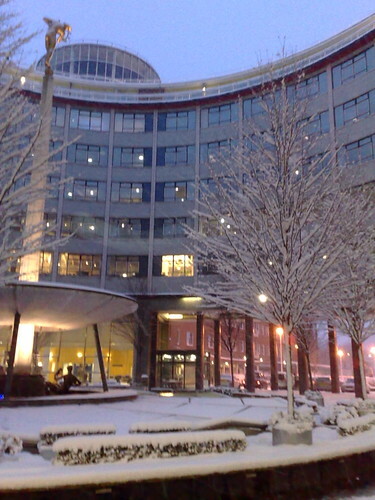 When I started at the BBC in August 2002, working as the Assistant Producer on Celebdaq, I was initially based at Centre House. Separated by the Central line and Wood Lane, we could see TVC as it’s universally known and wanted to be there. Why? Because there was and is something incredible about being able to say “I work for the BBC at Television Centre”. Guitarist Steve Cropper said – in the BBC’s Dancing In The Street – that going in every day to Stax was like going to church. That’s how I felt about working at Television Centre (albeit with less religious observance). I worked in the East Tower when we moved over at the beginning of 2003 for the television programme on BBC Three and I remember how validating it felt to be working at what was then, and still is in the minds of many, where the BBC comes from. You got to walk down corridors and see the biggest names in broadcasting, many people you’ve grown up admiring and aspiring to be in the shoes of, going about their work. There was something really inspiring about knowing that just down the hall, Jeremy Paxman is prepping to put another politician on the rack while Top Of The Pops are recording performances by chart toppers. Nearly knocking Sir David Attenborough and Sir David Frost out with a swing door while rushing along with a tape for broadcast. Absentmindedly staring into the middle distance and realising that I was being stared down by Jeremy Paxman in the sandwich queue. A colleague declaring their working life complete having seen Jeanette Krankie in a giant baby grow smoking a ciggie out by Stage Door where the taxis arrive and depart. Having a wrap party gatecrashed by The Libertines in ponchos after they’d been recording for Jools Holland and our Production Manager throwing them out not knowing who they were at a time when they were the hottest band in the UK. I’ve eaten a lot of meals at TVC, some of which you wouldn’t feed to a starving dog. It’s with good reason that The Filling Station, despite name changes, is universally known as The Killing Station – the twitter account is not a parody so much as a factual report from the frontline of BBC catering. It’s always been a great leveller: that no matter how grand your job title or salary, you still are the same person as the lowliest receptionist when faced with the culinary options. You might be the Director General but in the canteen, you too will face the warm, fuzzy indifference to rank from the food and sometimes staff, as you try to identify whether the day’s special is actually a trick question. When I started there were two full restaurants running lunch and dinner services with completely different menus in the Restaurant Building (Classics and Showstoppers). There was also The Foyer, where programme executives would take their latest star presenter for lunch to show them off the rest of the BBC if they didn’t want to risk them getting bare soused in the BBC Club Bar, where inexplicably the same food cost more. For a sandwich there was Green Tea Bar, where portion control was an unheard of concept. Rarely have the limits of how much filling a baguette can take been so rigorously tested on a daily basis. But the one place that never got the catering wrong was Snack Express. Out by the satellite dishes, housed in what was essentially a mobile kitchen van, it’s menu was pure British manual labour: Breakfast rolls with a choice of freshly fried bacon, egg, sausage, tomato or mushrooms ; strong tea; lunchtime burgers or sausage with onions and a full fat Coke; full range of condiments and sauces, both red and brown. It’s where you took your hangover and came back cured. It was where you got the best gossip about what was going on elsewhere and where you promised to go to cheer everyone up with a round of bacon rolls on a grim midwinter morning. I cannot begin to explain how sad I felt the day I came in to work and realised it was gone. The BBC Bar was, for many years, where the real business was run from. Everything of significance in the BBC could probably be traced back to the bar somewhere in its lifetime. Coming in for coffee in the morning, you’d see a table surrounded the night sparks, scene shifters and other craft workers coming off the nightshift. They’d be on their second pint and the ashtray would be full. By the time you came back for lunch, they’d have probably sloped off to a quiet corner to sleep it off. Truly, it was a 24 hour operation. It was where, mid-morning through to mid-afternoon, you’d deduce who was moving jobs and who had a grievance to air, loudly and for the benefit of whoever might happen to hear their conversation in passing. Going to the bar was sometimes the most sensible course of action in developing your career – if you could manage the politics of a round of lunchtime drinks in there, you could cope with most things that would befall you in the BBC. And from about 4pm it was where you slunk off to drink, smoke and laugh about work. You were always certain to see familiar faces in there. It was less a joke and more a statement of fact that they best way to find certain reporters or producers would be to go to the bar. Sometimes you’d see someone looking worse for wear mid-afternoon and then delivering a brilliant report on the Six or Ten O’Clock News. “Meet you in the bar”, such a beautifully phrase that holds so many great memories. Over the years the departure lounge at Stansted furnishings were superceded by imitation private members club decor. At one point it was obvious that the place had been redecorated by someone who spent a lot of time in Century on Shaftesbury Avenue – perhaps making the talent feel at home. These days, it’s glory has passed, with shorter opening hours and staff with far less time for simply talking to each other. It’s a confusing building to find your way around, not helped by the ad hoc placement of operations over the year. But you strip it back to the core function of broadcasting studios and there’s a briliance that goes un-noticed by many. Take for example the circular shape of the main hub in which studios TC1 to TC8 are based. There’s a ring road that runs along the back of them and each one opens out onto it, meaning that loading in and out is universal to all of them and can be done without fuss or bother to anyone who doesn’t need to see it. No crates being hauled down corridors, no vans or trucks blocking up other areas. It’s a small thing that actually makes a significant impact on working here. Like the catering, finding your way around was a leveller, initiative test and brainteaser wrapped into one. Here’s an example: Where is TVC 5556? Next to TVC5554 or opposite TVC5555? No, it’s inside TVC 5550. You were only as good as what you knew. Being able to find your way to an obscure meeting room in the basement of Stage 5 TVC or how to get from the East Wing to TC11 was as valued a skill as whether you could type an Aston without a typo. Actually, the former skill was probably seen as a key requirement to be able to progress to the latter. Sometimes people forget that beyond the presenters, producers and journalists, there’s an entire family of people who make this place run. And I mean it when I say family. There’s people here who I’ve seen almost every day of my working life here, whose names I can’t remember or don’t know but who I can smile at without feeling like an idiot. When I was at BBC Radio 5 live there was Martha, the Polish girl who ran the cart on the Second Floor which served the Newsroom with tea and coffee. She loved working here and the opportunity of talking to the biggest journalists in the world which also gave her the perfect opportunity to improve her English. And we all loved talking to her. Her successor, Dorothea carried on that tradition of caring about her customers as if they were friends. It’s people like that who bind this place together. There’s the porter with a magnificent moustache who always has a smile and a nod as he goes about his business of moving our parcels and boxes from one end of the building to another. There’s the lovely West Indian lady who has worked in Centre House, White City and Green Tea Bar in the time I’ve been here and who always has a friendly word for you. No one minds that she still can’t remember where everything is on the till. Tomorrow, for perhaps the last time, I’ll come in through the Frithville Gate on my bike, park next to the massive satellite dishes that nestle next to the Hammersmith and City line, somewhere on what was the site of the 1908 Great Exhibition at White City. By March 2013, it will join the long list of former BBC buildings deemed surplus to requirements. In my time that includes Bush House, Centre House and Kingswood Warren. Even if – following redevelopment – it becomes the base of BBC Studios and Worldwide, it will be nominally a BBC building again, it won’t be returned to what it was as the BBC will have abandoned W12 as its London base. The list of property the BBC once owned in London is longer that the ones it still does: Lime Grove Studios, K-West Hotel, The Langham, The Lawns, Shepherds Bush Empire (Television Theatre). We even built over the 1908 Olympic stadium with ‘Ceaucescu’s Palace’, better known as White City. No one has really mentioned the long term economic impact on the area: the BBC’s departure represents a lot of people to take out of the local economy. Anecdotally, one of the falafel shops in Shepherds Bush Market claims to have lost 40% of their trade now that Sport, Childrens and 5 live are no longer providing regular custom since their move to Salford, taking roughly 1500 BBC staff with them. With everyone from News being moved back to New Broadcasting House and other parts shifted elsewhere it’s in the region of between 5000 and 7000 people no longer contributing to footfall and purchasing in the W12 area on a daily basis. That’s a lot of passing trade that simply won’t be there anymore. I will miss TVC. Broadcasting House may be shiny, new and exciting, but it will never be BBC Television Centre, Wood Lane, London W12 7RJ, the place I always wanted to work when I started my career in broadcasting.